This morning we had a play date at Allison & Ian's house. 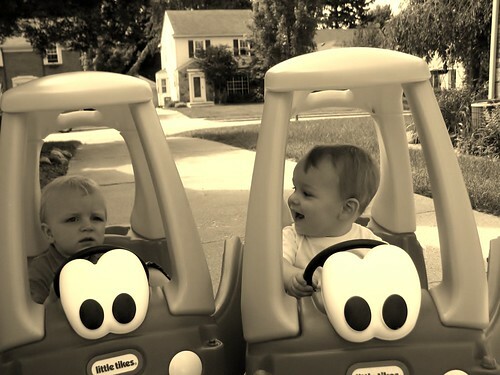 The boys are ALWAYS fighting (I mean hitting, and pushing, and biting) over the ever desirable Cozy Coupe car. So today Allison brilliantly suggested that we bring Luke's Cozy Coupe to their house, so that they could each have their own. I'm not going to say that there was absolutely no fighting today (Luke still came home with two scraped knees...), but I guess boys will be boys!